As the Sam the Record Man flagship location prepares to close its doors for good at the end of June, cries from Torontonians embracing the building's heritage can be heard from around the city. Facebook groups pleading to "Save the Sam's Sign" have sprouted up and petitions have been posted online with thousands having signed up to support the cause. Heritage Toronto has been told "that the City of Toronto would be going forward to designate the sign [as a heritage property.] The designation will describe the sign, location and require that should the site be redeveloped the sign will be reinstalled, same location and be lighted at night." While Sam's truly is a Toronto institution it should be noted that the corner of Yonge and Gould has not always been the home of Sam Sniderman's creation. The massive record store moved to the corner in 1961, having previously existing as a record department in the Sniderman family store. Years before, the corner of Yonge and Gould was just as exciting, just as interesting, and just as commercial as it is today. It may have looked very different, but its heart was in the same place. 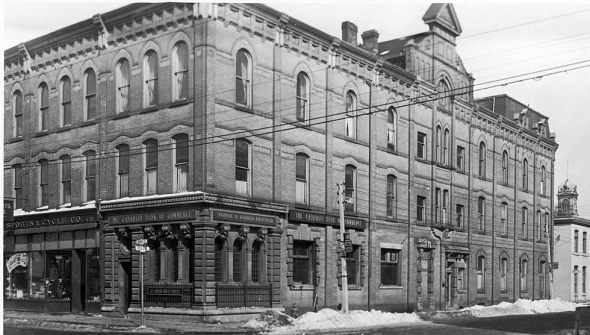 Standing at that corner almost 60 years ago, one would have been looking up at an entirely different structure, one housing the Canadian Bank of Commerce. The large, regal, brick building was definitely a stark contrast to the lighted neon signs that now occupy one of Toronto's most famous corners. Looking east down Gould Street stood the old Toronto Normal School building. The school was renamed the Ryerson Institute of Technology in 1948, and would eventually become Ryerson University. The majority of the Normal School building would be demolished in 1962, the year after Sam the Record Man made this corner its home. Beside the bank stood Brown's Sports & Cycle Co. Limited, occupying the space that now serves as one of the entrances to Sam's. 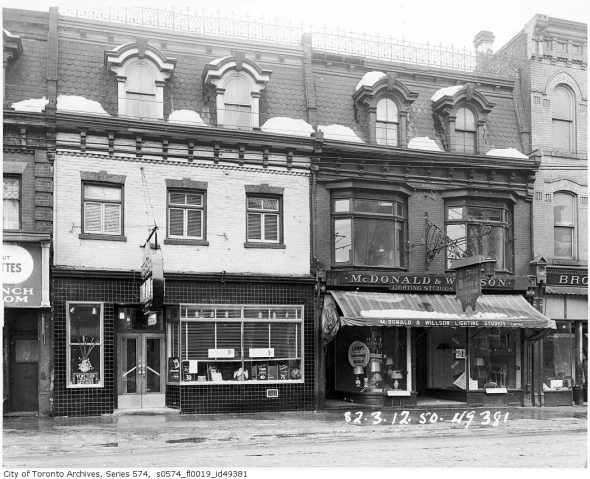 While neon did not illuminate the street at this time, this area of Yonge Street was not without light as 347 Yonge housed McDonald & Willson Lighting Studios Limited back in the early 1950s. 347 Yonge is now the address of Sam the Record Man. Yonge Street in the early 1950s was, like it remains today, one of the busiest areas of Toronto. The street was a centre of commerce and entertainment. In 1954, when the first subway line came to Toronto, tracks were laid down in front of the Canadian Bank of Commerce building, replacing the streetcar tracks that once lined Yonge Street. Giant neon rotating records or not, the corner of Yonge and Gould was an interesting area, filled with excitement and energy, mixed in with a dash of corporate commerce, and a little bit of x-rated sleaze. While the buildings may have changed, the area's vibrancy has stayed the same. When Sam shuts its doors at the end of June, another chapter will be written in the history of this energetic intersection.